I intended to write about Kasabian Beck’s current exhibition A' l'inte'riur at Da Vinci Isle Galleries (well worth a visit - I'll review soon). But when I began to take a closer look into the breadth and depth of Kas’s work I found more to cite. Where to begin then? He deserves multiple posts. As an archivist in the actual world, I’m fairly obsessed with film and photographic print preservation. Kas appreciates traditional photography too, as illustrated in a concurrent exhibition at the Poperation Gallery. The exhibition, titled 8 Good Reasons to Save Polaroid, shows a series of prints created by Kas, depicted in instamatic, or integral, film style. The images are rather hawt. Fragmented via collage, mysterious women peer at you through their lashes. The viewer glimpses the top of a tube sock, the back of a beautiful lingerie clad brunette, tiles on a floor, inconsequential details blown up and coveted. So, for those of you hoarding your own memorable snaps, in the name of preservation, do your duty, readers: visit www.savepolaroid.com and visit the Poperation Gallery . 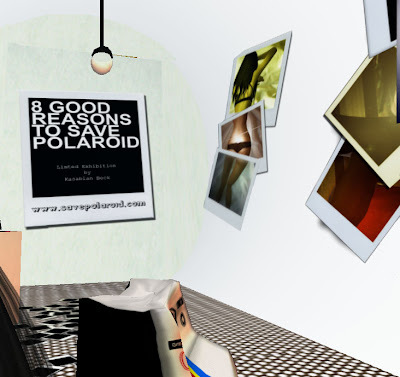 8 Good Reasons to Save Polaroid will be up until February 1st.